We all know that the summer months are jam-packed with fun, memories and miles. Throughout the summer, FFA members across our state find themselves working hard, packing and traveling. 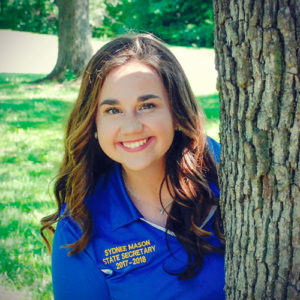 They trek to our nation’s capital for the Washington Leadership Conference, are cruising down to Camp Rising Sun for State FFA Leadership Camp, or are working with their animals in preparation for the Missouri State Fair in Sedalia. Throughout my FFA career, I’ve made so many of these memories, but I never appreciated them until I took the time to stop, step back and reflect. This reflection process leads me to a state of immense appreciation. I feel so thankful for my parents, advisors, teachers and mentors for turning all these summertime opportunities into reality. I’m willing to bet that every Missouri FFA member can name at least one person who helped them transform one of those “what ifs” into a memory they will hold onto forever. Think about the feeling that role model would have if you took just five minutes out of your busy summer day to say thank you. FFA Members, as our busy summers come to a close and a new school year begins let’s all take the time to stop, step back and reflect on those memories we’ve made this summer. Appreciate those who helped us make them.